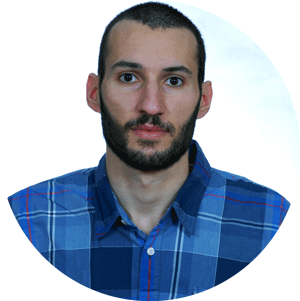 I am a PhD candidate at the Control Systems Lab (CSL) of the School of Mechanical Engineering at the National Technical University of Athens (NTUA). I received my 4-year BSc in Applied Informatics at the University of Macedonia in Thessaloniki (Greece) in 2008, and my MSc in Artificial Intelligence at the University of Edinburgh (UK) in 2009, following my MSc in Automation at the National Technical University of Athens (Greece), in 2013. After working as a systems maintenance technician (2010) in the private sector, for the last 3 years I have been working as a research assistant at the CSL (NTUA) and as a freelance software developer. Throughout these years, I have developed a solid background in the Robot Operating System (ROS) using C++, embedded systems (TI TiVa, AM437x Industrial Development Kit, PC104 embedded computers, etc) and multibody dynamics simulation software. I am currently undertaking my PhD thesis at the legged lab of the CSL, under the supervision of Professor Evangelos G. Papadopoulos. Μy current research is focused on perception, motion planning and control for biomimetic legged robots in order to handle rough terrains and slopes. Worked voluntarily in the Hellenic Post Office of Hydra during the summer season. This was part of the Hellenic Ministry of Transport and Communications “Holidays and volunteering” program. Dissertation Title: Evaluation of the Webots robot simulation environment during quadruped robot motions, and comparison with alternative software. Project Achievement: The project's goal was to build a Webots model of the lab's (NTUA CSL) Quadruped Robot and using Matlab programmed controllers perform a number of tests on various terrains in order to evaluate the software and the controllers. Project Achievement: Building a framework that performs motion processing on demonstrated data, and reveals the information necessary, in order to “rig” a motion on an FSM representation. Project Achievement: Analysing and evaluating the MRDS platform by setting up various robot navigation scenarios. Another important outcome of this project was a manual for the MRDS (in Greek) which can later be used by the university students on future projects. Computer Programmer | Web Developer. Academic Research Program: THALES - "Biomimetic Legged Robots Operating in Rough Environments"
Representing University of Macedonia I was responsible for informing the public on broadband services using specific demonstration scenarios (video streaming, video conference, distant learning, etc.). • Excellent oral and written communication skills (presentations, experience abroad, personal interaction and written correspondence). • Participation in various teams and ability to adapt to multicultural environments. The page you are visiting concerns the activities of the research team of Prof. E.G. Papadopoulos. The CSLab belongs to the Mechanical Engineering School (ME) of the National Technical University of Athens (NTUA), at the Zografou campus. The CSLab is a part of the Department of Mechanical Design and Control Systems (MD&CS) of ME. According to the Establishing act of the Department of Applied Informatics, its mission is to promote and further develop the science of informatics, with special emphasis on the development of systems for managerial and economic applications and the training of high level executives for the country's needs. Gazebo offers the ability to accurately and efficiently simulate populations of robots in complex indoor and outdoor environments. At your fingertips is a robust physics engine, high-quality graphics, and convenient programmatic and graphical interfaces. Best of all, Gazebo is free with a vibrant community. Webots is a development environment used to model, program and simulate mobile robots. With Webots the user can design complex robotic setups, with one or several, similar or different robots, in a shared environment. The robot behavior can be tested in physically realistic worlds. Multibody Dynamics Simulation. Adams is the most widely used multibody dynamics and motion analysis software in the world. Adams helps engineers to study the dynamics of moving parts, how loads and forces are distributed throughout mechanical systems, and to improve and optimize the performance of their products. Qt is a cross-platform application development framework for desktop, embedded and mobile. Supported Platforms include Linux, OS X, Windows, Android, and others. Qt is a framework written in C++. A preprocessor, the MOC (Meta-Object Compiler), is used to extend the C++ language with features like signals and slots.